This 6th and last lecturing period of the year, I run a capita selecta course on Food Culture with some of the students from the regular course in February in which we read and discuss classics in food culture together. Like two years ago, there is a small but dedicated group of students eager to read entire books rather than the usual scientific papers. We just finished ‘Paradox of the Plenty’ by Harvey Levenstein, a very dense but easy and often funny to read social history of eating in the U.S. spanning from 1920s to about the 1990s. One of the stories to which we awed with amazement is about the abundance, diversity and quality of the food supply and diet of American soldiers during World War II. “Those who overran American positions often expressed amazement at discovering the quantity and variety of food GI’s had at their disposal, as did those fortunate enough to be taken prisoner by the Americans” Levenstein writes (p89). Highly influenced by the embryonic nutrition science, it was believed that the population was gravely malnourished and had just about enough or latent deficiencies of many if not all of the just discovered vitamines. Hence, “modernizing military men had revamped their military rations” to “provide each soldier with all the necessary nutrients and at least five thousand calories a day” (p92,93). FIVE thousand? This provoked especially the nutrition students. Of course we had no idea about how current troops are being fed at battlefields until one of the students revealed a box she had received from her work at the Food Bank – after much talking and persuasion because the Food Bank decided not to distribute the army donation. 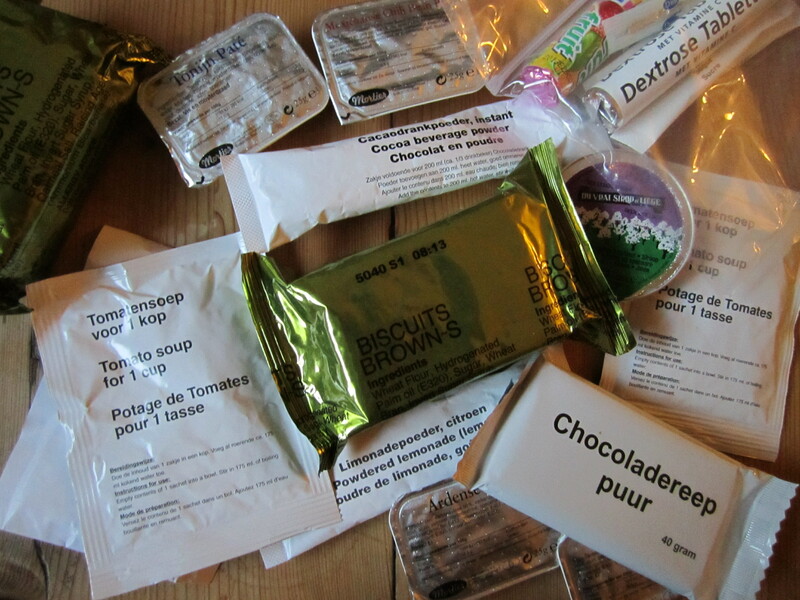 The Nato approved ration for 1 person gives insight in the current nutrition ideas and food technology usage. Breakfast and lunch in combat times consists of a box instant powders (soups, lemonade, chocolate milk), patés (mexican chili beans) and biscuits accompanied with chocolate bars, mentos, dextrose. The amazement at the crazy Americans was brought home with opening this box. After all, we always look West, they are only a bit earlier. This entry was posted in Education, Food and tagged food culture, Levenstein, nutrition, Paradox of the plenty, world war II by Petra Derkzen. Bookmark the permalink. Interesting, Petra! Curiously, the dining hall rations at US military academies are still “fortified”, so to speak – at least I believe so. I was an athlete during my university years, and I remember traveling to compete versus the US Naval Academy. There we ate in the dining hall. I don’t remember how we “found this out” – I think through some coaches / teammates were military or ex-military??? – but it turns out that, still today (or at least, say, 2001), they load up the “rations” of soldiers and sailors with all kinds of supplemental stuff – not only to add vitamins, but also to add extra calories – the latter of which I think is a perplexing choice given that the US Association of Retired Generals and Admirals ALSO just published a report calling for better school nutrition to combat the problem that *** 27% *** of would-be recruits are ineligible for service due to obesity … and 66% of active-duty military are overweight or obese (according to this report of the Military Health Service http://www.tricare.mil/survey/hcsurvey/issue-briefs/issuebriefCY05Q1.pdf ) [though, to be fair, I think this is probably an overestimate, as most military folks I know are rather a bit more muscular than your Average Joe …].